Brewed with lactose, vanilla pods, espresso and chocolate for a complex, creamy finish. 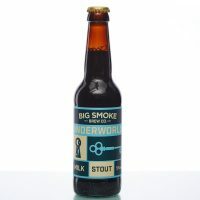 Big Smoke Brewing Company has been operating out of the former stables at the back of the Antelope pub in Surbiton, London since 2014. They aim to brew flavourful, seasonal and drinkable beers and their range represents years of tweaking, trialling and tasting – as well as feedback from their regulars at the pub! The majority of their output is sold at their two pubs, the Antelope, and the Albion in Kingston, although their beer can occasionally be found in other venues around London and beyond. Underworld Milk Stout is brewed with lactose, vanilla pods, espresso and chocolate for a complex, creamy finish. It uses classic English hop varietal Fuggles for a gentle bitterness and soft aroma, with the hops taking a back seat to an aroma of freshly-pulled espresso coffee and sweet vanilla. The grist is complex and nuanced with most of the colour coming from the German Carafa Special III malt which helps keep the bitterness in check. Underworld has won several awards in its class and is a firm favourite of mine!